Supergiant debuted its latest title on the Epic Games store, and now the studio’s sophomore game is about to free to claim on the service. As tradition dictates, now that the store’s latest free game, The Witness, is live for the next two weeks, Epic has revealed that the next title you’ll be able to claim is Transistor. 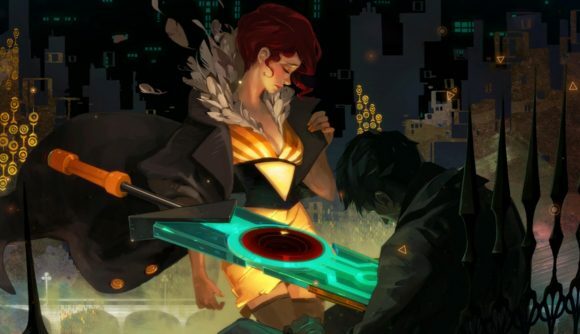 Transistor will be free to claim from April 18 to May 2. As always, you’ll be able to claim the game, tie it to your account, and play it in perpetuity from then on. Typically, Epic Games store titles will run just fine without the launcher once they’re downloaded, so if you’re that concerned about running another game client you can just launch the game straight from the executable. Supergiant’s tradition of great art and incredible music continues shows through strong in Transistor, though this time it’s a cyberpunk-style future setting. It’s an action-RPG with heavy strategic elements, where you can endlessly rebuild and customise your loadout to expand your combat options throughout the game. It’s almost surprising it’s taken this long for a Supergiant game to hit Epic’s free games program. Hades launched alongside the Epic Games store as one of its first exclusives, and it’s going to remain there until it completes its early access development. If you’re looking for something more immediate to play, you can grab The Witness from now until the Transistor deal goes live. Epic’s selection of free games has continued to offer some excellent titles, and – while there’s no accounting for taste – there’s yet to be a dull title in the bunch. The promotional giveaways will continue throughout the year, so stay tuned for more.